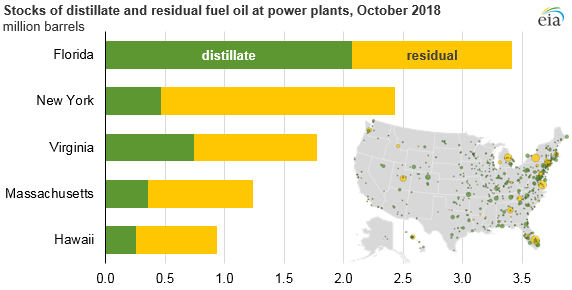 EIA now publishes data on monthly and yearly plant-level oil stocks at electricity-generating power plants. Power plants that burn petroleum liquids (such as distillate or residual fuel oils) are generally used for short periods during times of peak electricity demand. Plants keep oil stocks on hand so they can be prepared to dispatch at the times of peak demand, such as during hot summers and cold winters when coal and natural gas supplies decrease. Otherwise, petroleum-fired power plants operate mostly intermittently, at low capacity factors, because of the high price of petroleum relative to other fuels, air pollution restrictions, and lower efficiencies of their aging generating technology. Regionally, the most current data show the largest volume of oil stocks are at power plants in the South Atlantic region. As of October 2018, power plants in Florida had the largest oil stocks, totaling 4.1 million barrels, followed by New York (2.9 million barrels). Virginia, Massachusetts, and Hawaii all had oil stocks at power plants totaling more than 1 million barrels. Four states have one power plant with oil stocks exceeding 500,000 barrels of oil: Florida, Virginia, New York, and Massachusetts. The relatively large quantity of oil stocks at power plants in these states reflects investment decisions that account for natural gas pipeline constraints as well as the difficulty of transporting coal to these regions. Hawaii uses petroleum for generation continuously, and plants receive petroleum liquids regularly throughout the year. 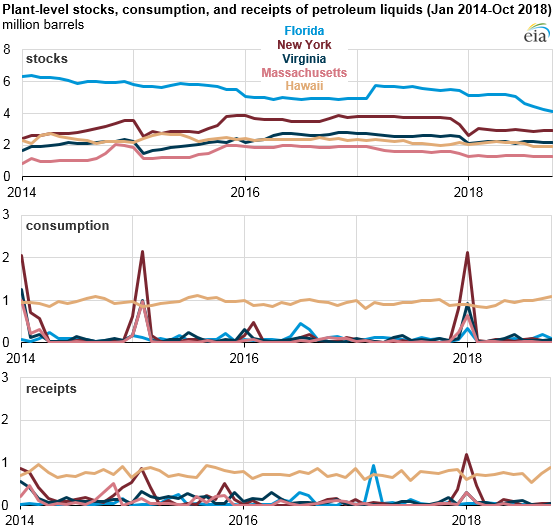 In the other states, consumption of petroleum liquids at power plants peaks at times of high demand, and receipts coincide with periods of high consumption. Limitations on capacity for regional natural gas into New England and New York City have resulted in higher natural gas prices and increased burning of oil for electric generation. Most recently, during the bomb cyclone of the first week of January 2018, oil-fired generation accounted for about 30% of the total electricity generation mix in the New England Independent System Operator region. More than one third of New England’s natural gas capacity has dual-fuel capability with oil as a secondary source, while about 40% of oil capacity can switch to natural gas, and about 50% of coal capacity can switch mainly to oil. Oil stocks data are collected monthly from more than 1,800 power plants; the annual data include plants that report monthly as well as approximately 5,800 additional plants. All power plants with one or more generating units must report their stocks if their total generator nameplate capacity with a primary fuel of coal is 50 megawatts (MW) or greater, or if their total generator nameplate capacity with a primary fuel of any combination of natural gas, petroleum coke, distillate fuel oil, or residual fuel oil is 200 MW or greater. Plants report the barrels of oil stocks on site at the end of the reporting period. Data for oil stocks at power plants as of the end of December 2018 will be released in late February, and complete 2018 data are expected to be released in November 2019.